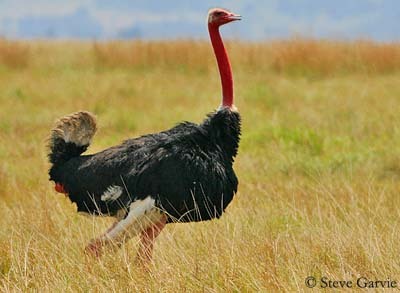 Ostrich is a large bird which does not fly. It is the largest bird living in the World. Male has black glossy plumage, with supple feathers on back. Primaries and tail are white, making it easily visible. During breeding season, the bare parts become brighter. Female and young have brownish feathers instead of black and white, allowing them better camouflage. Male and female have bare neck, as the legs. Skin is blue-grey or pink in male and pinkish grey in female. They have a long and moving neck, a small flat head, large eyes with long black lashes, powerful whitish legs with two toes. The broad bill is flesh-coloured. S.c. camelus : W and S Sahara, Sahel. It has pink neck with white collar, and feathered crown. S.c. molybdophanes : Somalia and Kenya. It has grey neck with indistinct white collar, and bare crown. S.c. massaicus : S Kenya to Tanzania. It has pink neck with white collar and almost bare crown. S.c. australis : South Africa. It has pinkish-grey neck and lacks white collar. Crown is slightly downy. These species differ by bare parts’ colours. They have bare or partially feathered crown. We also notice the presence of a white collar more or less visible. 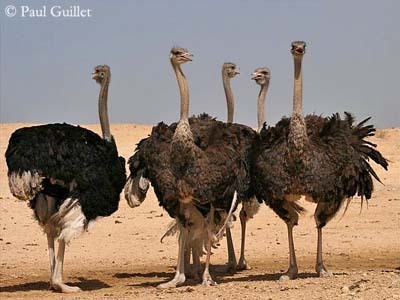 Ostrich is often silent, but it has call’s repertory including whistles, growls and booming. These calls are uttered by males and are very loud and heard at great distance "boo-boo-booh-hoo". 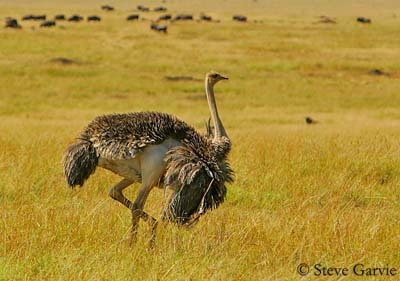 Ostrich lives in the driest zones of Africa, in savannahs. It can travel long distances for food and water. We find it in western, eastern and South Africa. 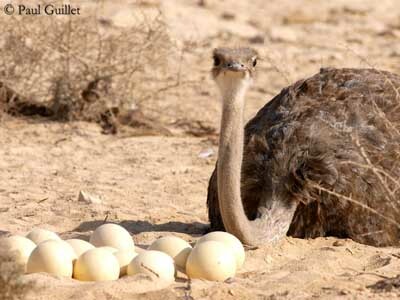 Ostrich has been introduced in Qatar, in the Ras Abrouq Peninsula, some years ago. They live and breed there. Some problems occurred with visitors who were attacked by one of them. Male and female may be very aggressive during the nesting period. While feeding, Ostrich frequently raises the head in order to watch over the surroundings. Not having teeth, it swallows pebbles which help it to crush the food within its sinewy stomach. They feed mainly on plant matter, but they also take some insects and small vertebrates. Ostrich is not very gregarious and lives alone or in groups of 5 to 50 individuals and we usually find it with antelopes and zebras. Each group occupies a territory from 2 to 15 squared km during the breeding period which lasts approximately 5 months. The powerful legs are its only defence against its natural enemies. If threatened, it can give vigorous blows. It has keen view and hearing, which make it able to detect a predator, even at some distance. It performs dust baths, like the other birds, but it likes water and bathes each time it gets a chance to do it. It can survive for long periods without drinking. It is also able to resist to a loss of 25% of its weight by dehydration. It satisfies itself with the moisture included in the plants which it consumes. Its feathers are used as insulator against the sun, but also to provide shade to the chicks. They are also useful for the courtship displays, during which the male flutters them in order to display its white feathers. Male can have from 2 to 6 females. It utters whistles and various sounds to threaten the others males. 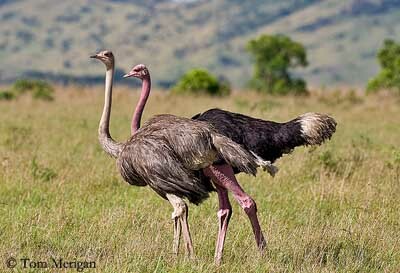 Once divided into breeding groups, Ostriches use community nests being able to receive from 15 to 60 eggs. The male defends the territory by patrolling about and giving “booming” used in disputes, and accompanied by threat displays or attacks if the intruder is a male. But if the intruder is a female, the male approaches and flops down on the ground with open wings and fanned tail. At this moment, is shakes each wing alternately and moves its tail up and down. Head and neck sway from side to side and beat against the flanks. Then, it walks towards the female with open wings and the bright red neck held out while it stamps. According to the response of the female, it may repeat the displays or mount her. If the female is ready for copulation, she adopts a submissive posture with vibrating primaries. After mating, the male leads her to one of the numerous prepared nests. 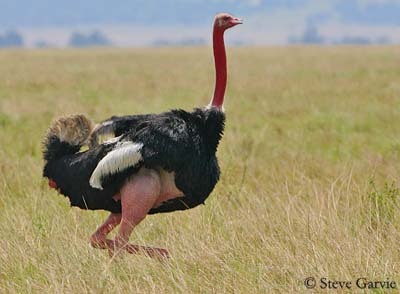 With its powerful legs and toes, Ostrich runs quickly in open areas, thus compensating its incapacity to fly. It walks at 4 km/h, it displays at 30 km/h, and flees frightened at 70 km/h. 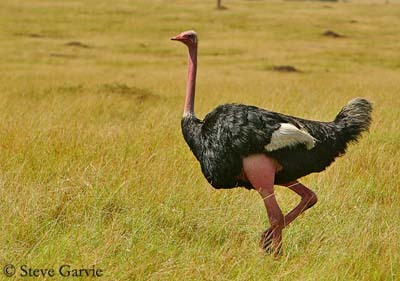 Ostrich breeds during the dry season. Male prepares several depressions in the ground, by scraping sand on its territory. It chooses the nest-site and several females copulate with him. Each female lays 2 to 11 cream-coloured eggs, weighing more than one kg each one, in the community nest. But only dominant male and female guard the nest. Incubation lasts approximately 6 weeks. 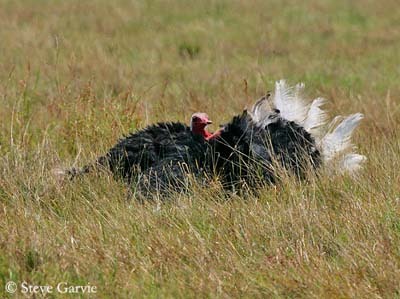 Dominant female sits on the nest during the hotter hours of the day, male replacing her at night. In spite of the constant survey of parents, less than 10% of the eggs will give birth to chicks. They weigh approximately 1 kg at hatching. They are rusty coloured with dark brown spots and a "shawl" of fluffed down on back. They leave the nest a few times after hatching. They reach the adult size at one year and half, and their sexual maturity at the 2 to 4 years of age. 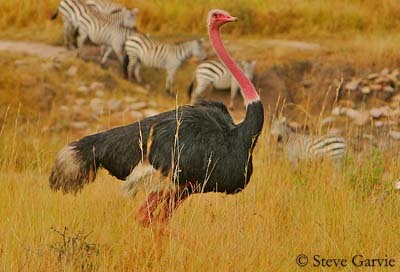 Ostrich is mainly herbivorous, and feeds on buds, leaves, flowers and seeds. It may sometimes catch lizards. It may also occasionally eat remains of dead animals abandoned by carnivorous predators. It consumes also grasshoppers. In captivity, an ostrich needs 3,5 kg of food per day, and it may reach more than 50 years of age. 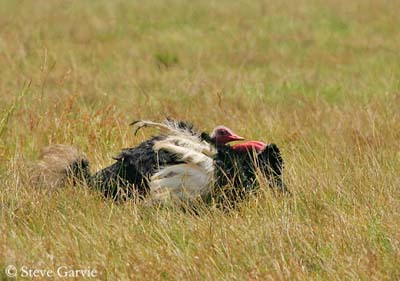 During many years, Ostrich was killed for its feathers, used as ornaments. 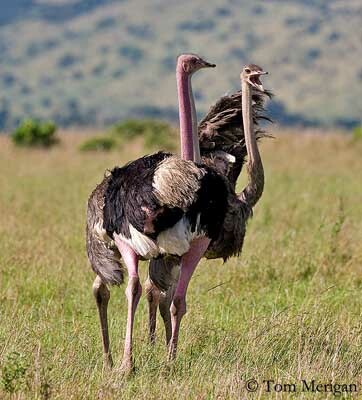 The farms of ostriches being more widespread, they allow this species to survive in free populations, the captive birds providing the various human needs. Numbers and distribution areas of this species decreased in dramatic way during the 100 last years, caused by hunting and habitat destruction. Today, it survives in protected areas in Africa. Chicks have some predators, such as the Egyptian Vulture, the hyena and the jackal. Only 15% of the young reach their first year, in spite of the close protection by both parents. 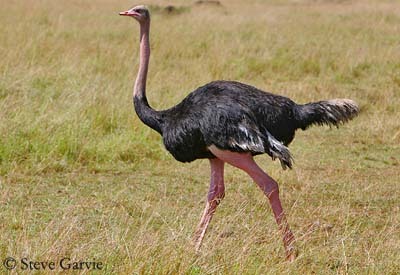 It is now a full species named Somali Ostrich. It is found in S and SE Ethiopia, Djibouti and Somalia, S to N and E Kenya.